We have traveled up 411 in Madisonville, Tennessee many times and I was attracted to the huge sign, “Bert’s Hometown Grill” that you can see easily from the highway. I had even gone as far as to look up their website, checked their menu and tried to read as many reviews as I could. 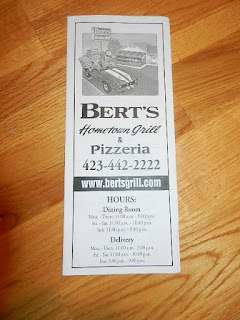 Last Saturday was our anniversary and I wanted to go someplace different and off to Bert’s we went. It was a nice ride on a beautiful Saturday afternoon and just 30 minutes from our home. We entered Bert’s and walked into the dining room area where someone greeted us and showed us to a table on what she called the porch – don’t worry, it’s an enclosed room not an open porch! It did take some time before our server arrived at our table and as soon as she took our drink orders she asked if we knew what we wanted. We did so we ordered right away. We both ordered the 8 ounce top sirloin steak which comes with garlic bread, one side and salad bar for $12.99. On the menu it clearly states do not order steak well done, which we never do. We ordered our steak medium-well. Since they don’t want you to order well done, we had high hopes our steak would be cooked perfectly. We were given two plates for the salad bar. We know well enough that a salad bar is a treat in most restaurants around here so any type of salad bar is welcomed. It contained basic lettuce which was fresh, tomatoes that good, sliced beets, broccoli. There were other items, but I am only listing those I took. They had several kinds of salad dressing and garnishes such as croutons. We both gave the salad bar a good rating. Both steaks were cooked well done. They were dried out and had very little flavor. I never use steak sauce but I had to at Bert’s hoping it would help. They were almost tender and would have been tender if not overcooked. The baked potatoes were just barely hot. They use ‘fake margarine’ and that is not for me. I don’t eat garlic bread, but I did take one bite. It was regular toast with garlic powder, nothing authentic about it. Our drinks were alright and we were asked if we wanted refills. The server however never asked how the food was, in a way she was lucky! We can excuse a restaurant having a bad day and there might have been a reason. On the way out we noticed a sign saying “cook wanted”….that says a lot! This was an anniversary dinner and I would not recommend gong there for such an occasion. Why? The noise level is extremely high! There were a lot of kids: babies, little ones and teens. It seemed to be quite a family place. We could hear conversations that took place several tables away. It isn’t conducive to quiet conversations! Would we ever go back to Bert’s Hometown Grill? If we happened to be in Madisonville, and happened to be hungry and the ‘cook wanted’ sign was gone and it was a weekday so the kids would be in school or home napping – then maybe, but then again maybe not! The options expressed are based on our visit on that particular day.